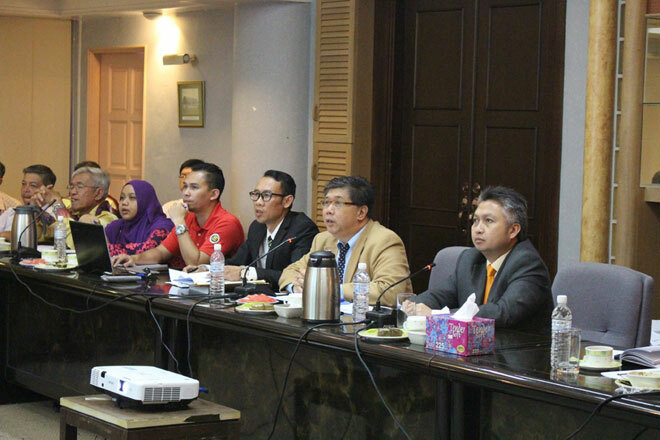 Ong (second right) briefs Snowdan (right), Muktalib (third right) and others on the medals target set by the respective sports associations during the Sukma XIX meeting on Thursday. KUCHING: Sarawak are still hopeful that taekwondo, weightlifting and sepak takraw will be reinstated in the 19th Sukan Malaysia (Sukma) in Perak this September. The three sports were dropped from the national core sports list last year, and were excluded from Perak Sukma. Youth and Sports Assistant Minister Datuk Snowdan Lawan, who expressed this hope, said Sarawak have appealed to Youth and Sports Minister Khairy Jamaluddin and the National Sports Council (MSN) on the matter. “Our MSNS director Dr Ong Kong Swee also brought up this matter in the last Sukma technical meeting on Jan 16-17 and all directors of the other state sports councils showed their unanimous support. “Our minister Datuk Abdul Karim Rahman Hamzah will be meeting Khairy on Feb 8 and this has to be decided at this high level meeting. The national sports associations and a few other states are also making their appeal on it,” he said after chairing a Sukma XIX meeting at the State Stadium in Petra Jaya yesterday. It was understood that Olympic Council of Malaysia (OCM) secretary Datuk Low Beng Choo will be forwarding an appeal to the Sukma Supreme Council which is headed by Khairy. Snowdan, who is the Balai Ringin assemblyman, said Sarawak’s hunt for gold medals would be greatly affected by the exclusion of the three sports. “We stand to lose about 12 gold medals, five in taekwondo, six in weightlifting and one in sepak takraw if they are dropped. “Please be fair. It is not only us who have made early preparations and I am sure other states have also made their preparations for the three sports. “If the problem is with the elite athletes, you cannot punish the rest of the athletes and it will affect the whole system,” he added. Snowdan said the training programmes for the three sports will continue as planned as Sarawak are not only looking at long-term development but also getting prepared in case that the three sports are included in this year’s Sukma. Snowdan said Sarawak have set a 77-gold medal target – if the three sports are included – in its bid to capture the overall championship crown in Perak. He also urged the state sports associations to increase their medals target as the ones set by them are too conservative. “By setting a higher target, the athletes will have higher spirit and if you set a lower target, then their spirit will be low,” he pointed out. To another question, Snowdan said the names of the Sarawak Contingent chef de mission and assistants chef de mission would be announced by Karim soon. Also present at the meeting were Sarawak Sports Corporation chief executive officer Dr Ong Kong Swee and assistant MSNS director Abdul Muktalib Mahamad.